A short one, but a good'un! I studied this poem for GCSE when I was at school, and I love it. I just love the imagery. If you'd like a bit of an analysis, you can read one here. Everyone has their own interpretations, though, so what's yours? 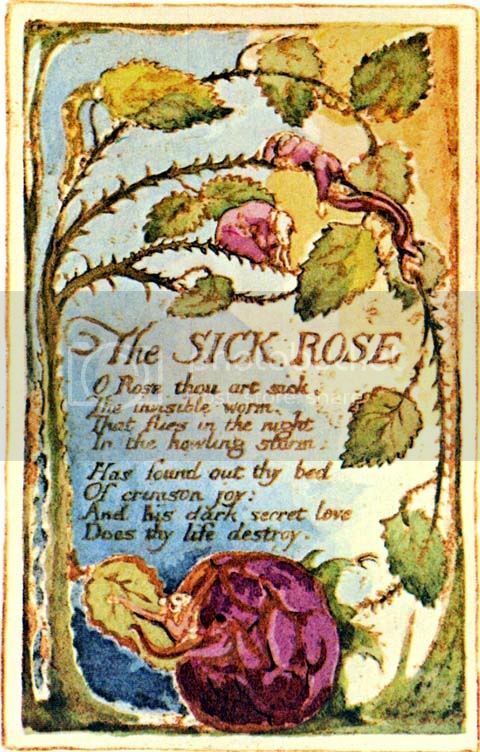 Mine is that it's about an affair - the Rose being the mistress, and the worm being the git who's married. Great post! I wanted to let you know, I gave you an award over at my blog! Thank you so much for joining this, Jo! I actually have this poem lined up for later on; I love it so much! No problem, it was a great idea! :) I adore this poem, it's just wonderful. You can really see it, lol. Your blog is so super cute!! I love the poem, thank you for sharing! So glad I stopped by!